Google's StreetView cars managed to spot more than just an uneven road sign when it caught a fire truck involved in a hit and run. 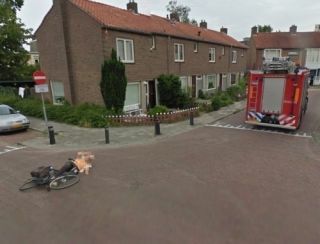 The incident occurred in Holland, where a woman was knocked off her bike by a speeding vehicle, leaving her sprawled in the road. Thankfully, she appears to be unhurt, with the Google StreetView team performing the rescue operation (of lifting her up and asking 'are you OK?' - presumably in Dutch). The location on Google Maps is still visible, but the frame in question has been apparently removed by Google. The Street View team might have been trying to make up it s Karmic debt, after it was spotted injuring a deer at the start of this year.